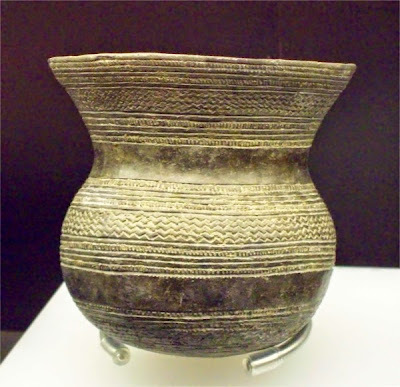 One of the most intriguing episodes in European prehistory is the spread of the Beaker Culture across the western half of the continent in the third millennium BCE. 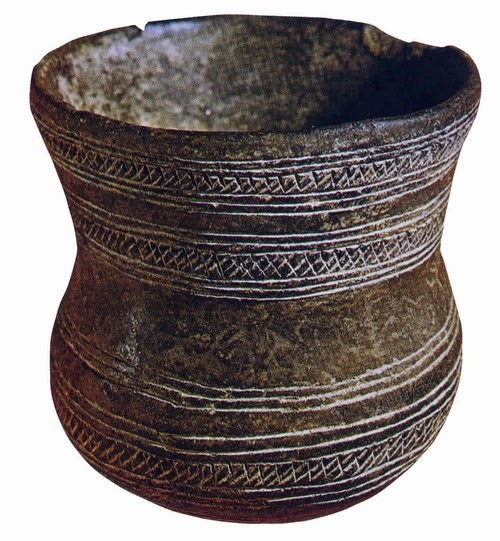 Above is a typical example of a "bell beaker;" you can see that both the shape and the decoration are highly distinctive, and although there are minor variations they are remarkable uniform across hundreds of kilometers and centuries of time. Study of their contents shows that many of them were used for drinking beer, and the whole complex has sometimes been said to represent the spread of beer drinking in Europe. The beaker people made much use of copper, and then they were involved in the introduction of bronze to many areas, so they have also been seen as pioneering metalsmiths. Certainly some of their high-status burials included metal-working tools. The range of the beaker culture. In most places the beakers appeared without precedent, obviously intruding into pre-existing cultures. However, there were two places where archaeologists claimed to see the beakers evolving from earlier forms: Portugal, and the Netherlands. These days the Portuguese coast around Lisbon seems to be winning out as the beaker homeland, because the radiocarbon dates for the first beakers there are coming out at 2900 to 2800 BCE, 250 years earlier than the first dates in the north. The oldest beaker burial yet found is actually in Morocco, so it may be that the culture originated in Africa and spread into Europe. The "beaker phenomenon" has always been a little strange, archaeologically, because it seemed to overlap with older, unchanged local cultures, existing side-by side; in some places it has been found only in burials, with the nearby settlements showing no trace of beaker influence. To account for these peculiarities it is still sometimes asserted that the heart of the beaker phenomenon was a religion. We see this most clearly in the burial ritual and the cultic drinking, but no doubt there were also gods and heroes that went along with them. It is certainly in its burial rituals that Beaker culture is most recognizable. The burials are highly gendered; men, at least higher status men, were buried with a distinctive set of masculine artifacts, women with an equivalent feminine set. 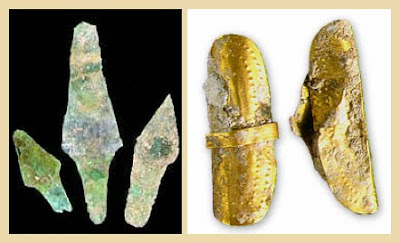 Men got boar's tusks, flint arrowheads, stone wrist guards, stone and copper axes, smithing tools; women got amber jewelry, grinding stones, copper awls; both got beakers, although in some places there may have been distinctive male and female patterns of decoration on the pots. In general, men faced east and women west, although there are plenty of exceptions. There are also a couple of women buried with archery gear; opinions differ as to whether these were female warriors or whether the bow and arrow had become a symbol of authority, so that a woman might be buried with a bow as a sign that she wielded great power while alive. The beaker people have been in the news lately because of their possible connections to new discoveries in European genetics. 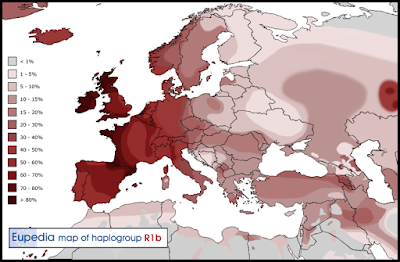 The most widely distributed Y-chromosome haplogroup in western Europe is R1b, as mapped above. It used to be assumed that this represented the genetic legacy of the Mesolithic inhabitants, but apparently this can't be so; recent studies argue that it must have spread within the past 10,000 years. Also, two of the spectacularly successful male lineages I just wrote about, which expanded dramatically around 5,000 years ago, are within R1b. So it may well be that at least some the clades of R1b that dominate western Europe spread with the beaker folk. 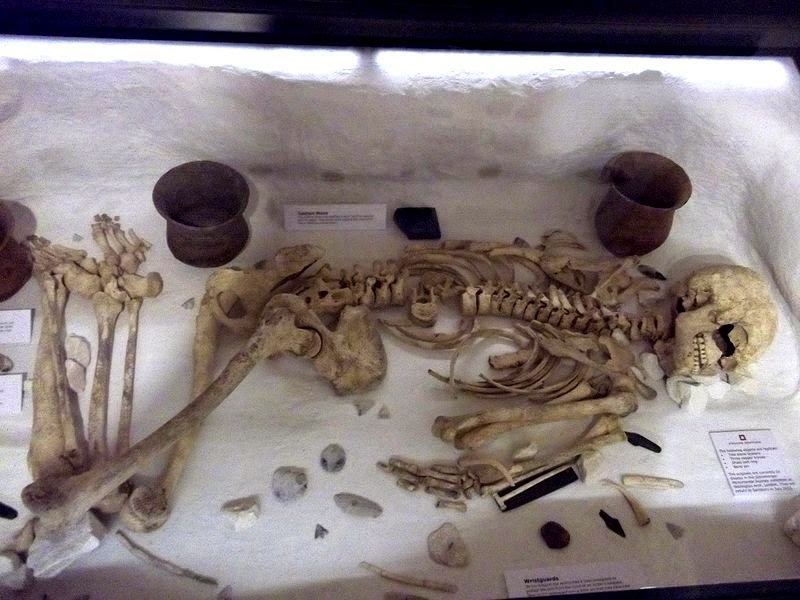 Evidence was recently published proving that at least some beaker men were R1b, in the form of DNA from two beaker burials at Kromsdorf in southern Germany. The same is being asserted about one mitochondrial DNA clade, H1; if so, this would mean that the beaker expansion included many women, not just men. In the 3500 to 2000 BCE period, the genetic dominance of Europe by the first farmers, people who migrated from the Middle East, was broken. There was a major disruption in the genetic pattern of the continent at this time, which implies major migrations and an influx of new people. 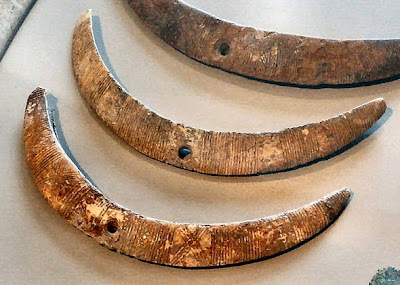 At around the same time the cultures of the earlier Neolithic were replaced by more advanced cultures that used animals for plowing and pulling carts and had other improved technologies: better looms, better beer, copper tools, etc. In northern and western Europe the two most important cultures are the Beaker folk in the west and the Corded Ware culture in the center. In the map above, the beaker culture is light green, the corded ware culture is blue, and the rather large region of overlap is dark green. Genetically, the men of the Beaker culture were mainly R1b, while those of the Corded Ware culture were mainly R1a. R1a clearly comes from the steppes. One interpretation of the Corded Ware culture has always been that it derived from certain cultures on the steppes, especially the Yamnaya culture (red on the culture map), and the genetic data supports this hypothesis. This seems the most likely time for the Indo-European languages to spread into Europe, carried by the R1a men of the Corded Ware culture. 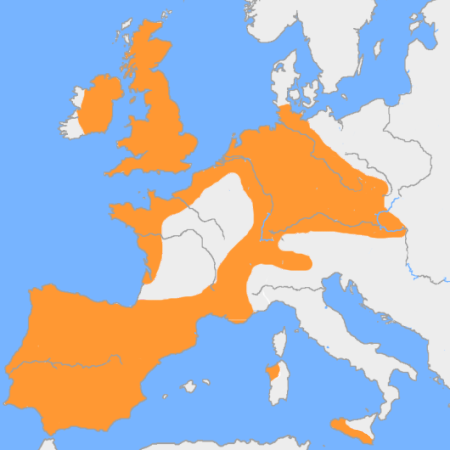 But notice that west of the Rhine the prevalence of R1a is low; the direct genetic contribution of the steppes to Italy and Iberia was very small. It seems likely that the Italic tribes formed in central Europe, in one of those regions that was only 30 percent R1a, so that after they entered Italy the genes that came from the steppes were further diluted. The new science suggests that the movements of people and the movement of languages were linked, but it does not show that they were the same thing. Since those major disruptions, there do not seem to have been any comparable genetic changes in Europe until the major immigrations of the post-1960 period. Down to World War II, the European population had genes from three sources: the Mesolithic inhabitants who moved northward after the Ice Age retreated, the Neolithic farmers, and the new groups that came in around 5,000 years ago. Movements since then have mostly been within Europe, so they have had local significance but have not changed the continental pattern. 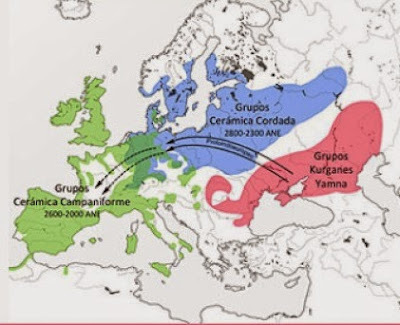 Above is one possible later migration, the spread of a Y DNA clade called R1b-S21 that some people think represents the early Germans, expanding after 500 BCE. I want to emphasize that this is a very simple schema, not a detailed picture. All modern populations are genetic mixtures, and this seems to have been true about all important European groups in the past. I expect to see a lot of simplistic crap over the next decade connecting this gene to that people, moving from here to there, etc. Most of it should not be taken very seriously. But it is amazing to think that we have learned so much so quickly about events that took place 5,000 years ago. Fascinating stuff, all new to me. If I'm reading all this right, R1b seems to be the most successful lineage. I take it R1b-S21 must be a later mutation of the original R1b? If so, R1b itself, judging from the table in the earlier post, was spectacularly successful. Would it represent just one male ancestor? One male ancestor, yes, but a long time ago. Each mutation happened, the thinking goes, only once. The mutation that created R-1 happened on the order of 18,000 years ago. R1b originated maybe 10,000 years ago. R1b-S21 is another mutation that happened in some man of the R1b clade. Etc. The time estimates come from looking at all the men who are R1b and seeing how many other diverse mutations they carry. The reason the estimate is so vague is that the mutation rates depends on the size of the population, which we have to guess. The business of explosive radiation I wrote about earlier is different; a clade can expand gradually over time without that happening. Great post. I agree with the genetic insularity of Europe post Early Bronze Age. I think this is part of what makes the Beaker and Corded phenomena so interesting on a cultural level. I also agree with the statement that this situation has changed with immigration policy and declining native birth rates beginning in the sixties, really the first major external change since the Late Neolithic. Do the Poor Have it Easy?